Droughts are one of the scariest and deadliest natural calamities. Droughts have claimed innumerable lives in India in the 18th, 19th and 20th centuries. Since agriculture is one of the main livelihood sources in India and it is depended on rainfall and water supply, a shortage in water affects agriculture badly resulting in famine and causes deaths on a large scale. Certain regions in India are drought prone. These areas receive an annual rainfall upto 60 cm and hence are severely affected where the monsoons aren’t enough. The Irrigation Commission of India has identified 67 districts in the country that are drought prone. Some of the states that have been identified as drought prone include Rajasthan, Odisha, Andhra Pradesh, Northern Karnataka and Maharashtra. 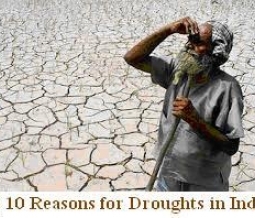 Inadequate or failure of monsoons is a major reason for droughts in India. Inadequate rainfall causes crop failure which lead to famines. Several famines have ravaged the country time and again and have claimed millions of deaths over the centuries. This is also related to rainfall to low or erratic monsoons. When there is less water in the atmosphere, the moisture present in the soils tends to evaporate into the atmosphere. However, this leaves the land barren and produces low yield of crops, resulting in famine. Thanks a lot It was really helpfull .